“Jen SX1000 in working order. All the keys and all the knobs are fully operational. The fascia has some age deterioration as can be seen in the pictures. There are a number of coloured caps missing from the control knobs which are all original and otherwise complete. Prior to my ownwership it had been modified to include an internal amplifier and speaker which I had removed and put back to original when I had it serviced. The holes that were drilled to act as a speaker ‘grill’ are still there, as seen. There are a few marks and chips but none of this affects the operation. It comes with it’s own purpose built wooden carry case. The case is lined with carpet underfelt which has become discoloured and could do with replacing. “Here’s a great little keyboard in fantastic condition, especially considering it’s been around for about 40 years! As well as retaining all the shiny coloured caps that usually seem to go missing from the knobs and switches, it even still has the cardboard templates that feature suggested settings. There are a few crackly pots that could probably do with a blast of switch cleaner, but every key works just fine and it makes some great noises. I’m no synth expert, so feel free to come and have a look/play and maybe someone can tell me what all these controls do! 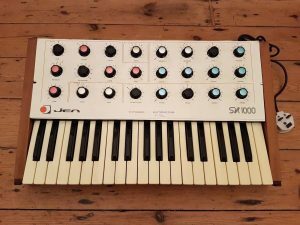 “Lovely little JEN SX1000 that has seen a major refurb to get it into really nice condition. All the electrolytic capacitors have been replaced with new but most importantly all the horrible old crackly potentiometers have gone to be replaced by very high quality new items. None of the pots make any crackles anymore and the JEN works just how it should. New knobs have been fitted to match the new potentiometer spindles and a headphone amplifier has been added to allow practice without an amp. 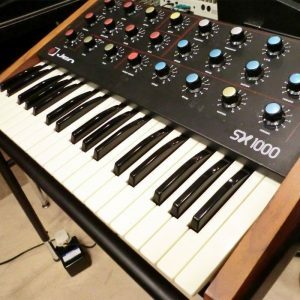 The SX1000 was many peoples first synthesiser back in the early 80’s and its sounds still hold a fond place in the hearts of many. They used to be everywhere but are getting increasingly hard to find these days. 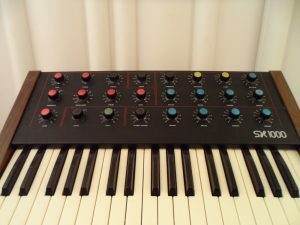 “Single DCO monosynth as used by LFO, Prodigy and various others. “Mint condition – everything 100% working. Italian made very very rare synth. Super phat bass and very ear piercing highs / filters. Cosmetic Condition: Item is in used condition with marks and scratches on the housing. Unit has some missing screws on the back. Functional Notes: Unit tested to power, audio output and all keys are responsive. “I dont mind admitting I have not got a clue how to use this, all I can tell you is all the keys work and when turning the knobs they all do something to the sound. 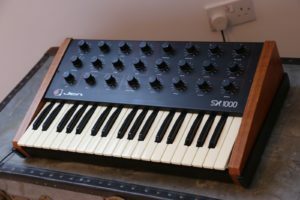 “Hi, here I have for sale a used Jen SX1000 Vintage Analogue Synthesizer. 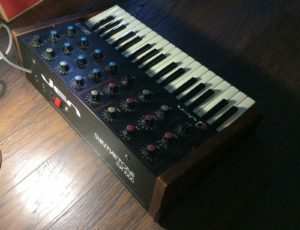 This mono-synth was made in Italy by Jen and in production between 1978-1982. It has a lovely sound and I personally love the pulse width modulation. Unfortunately I am having to sell due to the amount of room I have and for financial reasons, otherwise it would be a keeper! It has recently had all of the pots cleaned and they function perfectly, no scratchy pots on this one, the keys all function as they should too and it plays really well for a synth around 35+ years old. 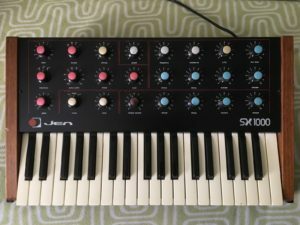 “Had this for a few years now and it is a great synth to learn on, however I haven’t used it for a few years so it’s up for sell. Overall, it’s in really good condition with only light cosmetic wear and a few knob caps missing. 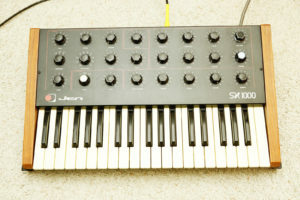 “This keyboard is in full working order and was serviced by Synth Professor (www.synthprof.com) in August 2012. It has also had the original short power cable replaced with a longer one. “All knob caps are present and correct. Everything is working, nice little synth. and a 13-page Midi Upgrade Installation and User Manual (pdf file). Made in Italy. Produced from 1978 to 1982. A low cost alternative to an ARP or Moog synthesizer with a similar big fat analog sound. to function as it should. Eight of the twenty-four Metallic Colored Knob Caps are missing. The two veneered wood end caps have some bumps, minor wear and chipping. One key is chipped underneath (hard to see and does not affect play). Great Analog Synth, originally Italian built, internal transformer modified to work both 120V & 240V without need for switch or external step down transformer. Fully functional, all keys, knobs, jacks, in full 100% order. A very capable synth on its own with a myriad of filter & midi mods available online (not included.) Very slight surface rust on rear panel which has not changed or degraded in the 22 years I’ve owned this synth. Power throw switch illuminates bright red when synth is on. Wood cheeks show minimal wear, really not bad for a 35 year old instrument. A number of colored knob decals have fallen off over the years, very easy and inexpensive to replace with DIY adhesive foil or decals (instructions online, not included) none of which effects functionality. 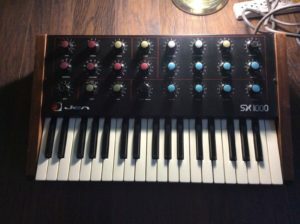 I have tried this through an amp and it sounded really good although I dont mind admitting that I’m not really sure how to use this but all the keys work, the knobs all turn, I have messed around with the functions and all of them seem to do something. It is in a very good used condition with just a couple of scratches to one or two of the knobs and just a little tarnishing to the metal at the back of the unit. • one knob is broken off through the shaft, so will need a new pot. Still have the knob though. • Somewhere between a quarter and a third of the keys are dead. A pretty easy fix, this. • One key is broken as pictured. • Keyboard slanted; generally needs attention as per the above. • It has clearly had some kind of retrofit in its life, but I have no clue as to what, or whether that element works at all. • Cosmetically a bit of the usual Jen mottling, and scuffs and nicks to the wood. Keys are grubby too; suspect a good clean when the keyboard issues are address wouldn’t go a miss! The good point however are that is still sounds pretty lovely – filter and envelope seem to work fine. Noise generator a bit hit and miss, but glide, vibrato etc all working. 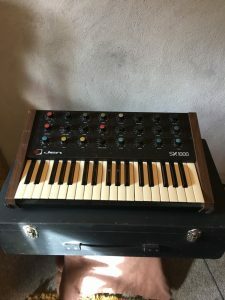 ” Here we have one of Martin Hannett’s early synths he was experimenting with in the late 70s around the time he went on to become a producer for Joy Division and John Cooper Clarke,and then later U2 ,The Stone Roses and The Happy Mondays. Like all synths of this age it could do with noisy pots cleaning up but you can still get some great early Hannett synth sounds out of it. “Beautiful vintage 1978 Italian monophonic syntehsizer. Good condition, had it serviced a couple of years ago.